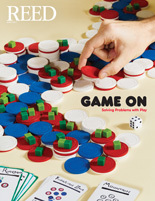 Reedies are taking an increasingly prominent role in Portland’s high-tech sector. Last year, Twitter snapped up Lucky Sort, an analytics company founded by Noah Pepper ’09, for an undisclosed sum. Now two other local tech firms founded by Reedies--Puppet Labs and Urban Airship--have been identified as likely candidates to go public in the next year. CB Insights, a venture capital and angel investment database that tracks activity related to private companies, speculates that both Puppet Labs and Urban Airship are poised for an IPO, or initial public offering--a critical step in the life of a tech start-up, much like a Broadway debut for a young playwright. 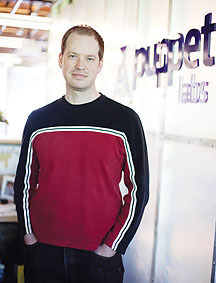 Puppet Labs, founded by CEO Luke Kanies ’97, is an information technology company, whose primary product, Puppet Enterprise, provides a platform for transparent and flexible systems management. The company employs more than 190 people and is headquartered in Portland's Pearl District. Urban Airship, founded by Michael Richardson ’07 and three partners, provides services for mobile developers and publishers with push notifications, location-based marketing and analytics. Michael is the company’s EMEA (Europe, Middle East and Africa) technical director. Lucky Sort builds a visualization and navigation engine that can mines vast troves of data to display trends in an easy-to-digest format. Reed's growing prominence in the Portland software scene is all the more remarkable because Reed offers no computer science major. Luke majored in chemistry, Michael majored in political science, and Noah in economics. Dr. Merrit Quarum ’81 at Qmedtrix, which makes software to contain healthcare costs. Christopher Grant ’83, project manager at the software company Tripwire. Steven Swanson ’84 at Elemental Technologies, a startup that builds video transcoding solutions. (Steven is also the husband of Reed mathematics professor Irena Swanson ’87). Ted Slupesky ’89, a developer with comic-book software company Plasq. Stacy Westbrook ’97 is the creative director at Webtrends. Erin McCune ’03 is an account executive at Integra Telecom. New Relic, a software analytics platform company, employs Juliana Arrighi ’07 as a technical support engineer and Brent Miller ’00 as a software engineer.